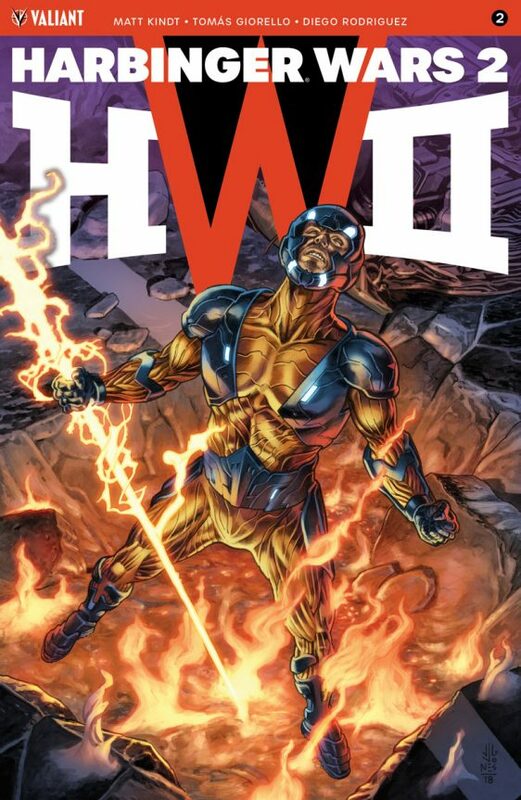 The biggest comic event of the year continues to roll on in Harbinger Wars 2 #2 from the team of Matt Kindt and Tomas Giorello. If this issue is any indication, it’s that things in the Valiant Universe are going to change forever…. This issue focuses more on the conflicts between Peter Stanchek and Major Palmer of H.A.R.D. Corps and X-O Manowar. Peter ends up using his psychic abilities to show these men their darkest memories. Meanwhile, the Harbinger Renegades are holed up in a safe house in Ohio where Peter has been bringing newly activated Psiots. The final story of this issue deals with Bloodshot infiltrating a G.A.T.E. hellicarrier to bring down the threats to the psiots. There is a lot going on here and it does not let go until the very last page. Once again the writing proves that Matt Kindt is the perfect person to tell this story. Yes the stakes of this event are big but what is bigger are the personal stakes of every single person involved in the conflict. Kindt shows us that every single person has a breaking point and that everyone is willing to do whatever it takes to win. One of my favorite scenes is one that involves Faith and a newly activated Psiot debating psiotic rights. The dialogue is so powerful, it also reflects a lot of the topics that are being debated today especially with immigration reform. I love the messages this book is telling, it’s one that needs to be heard. The art by Tomas Giorello is outstanding once again. The tone of the artwork matches the tone of the story in a perfect way. The colors are blended perfect and the detail in every panel is fantastic. The action set pieces are really well done and every character has their chance to shine in each one. Bloodshot looks great and the art helps set the tone for his mission. You really get the sense that things are bad and they are only going to get worse before they get better. If the art alone can tell me that, then that is something to behold.